Choosing a coffee table is one of the most important, yet often overlooked decorating decisions you’ll have to make. Coffee tables are often centrally located and they serve a very practical purpose inside of a living room. After all, without a coffee table, where would we put our favorite drinks, decor magazines, remote controls, and iPhones? The coffee table is arguably what gives a living room the most character. It typically holds personal items and decor accents from the home owners, reflecting their personalities. Personally, I think the coffee table is the second most fun part of designing a living room after picking out the sofa! From marble to reclaimed wood, there are so many fun coffee table designs to choose from – it’s hard to pick just one! Here are some guidelines and ideas for picking out the best coffee table for your family room! A coffee table should be proportionate in size to the sofa. As a good rule of thumb, the coffee table you buy should be at least one-half the length of your sofa, but not longer than the sofa itself. A nice happy medium coffee table length of three-fourths or two-thirds is perfect. The height of your coffee table should be about even with the height of your sofa seat, give or take a few inches. So what type of coffee table is best for your sofa? Well, it depends on the kind of sofa you have! If you have a standard horizontal sofa, then we recommend going with an oval or rectangular coffee table. 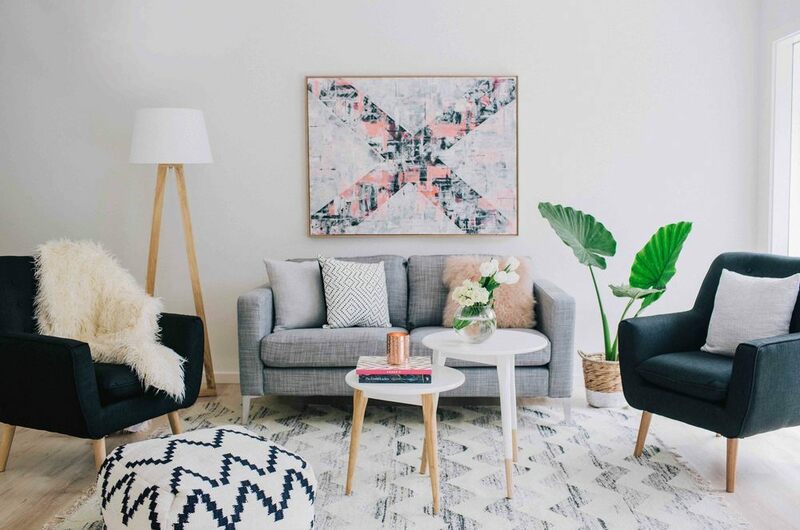 If you have a sectional or L-shaped sofa, then we recommend going with a round or square shaped coffee table to fit in nicely. Of course, you can definitely make it work without following these rules if you really have your heart set on a specific coffee table! Oval coffee tables are great at balancing form and function. They promote movement and offer ample space for storing things on top. No sharp edges here, so oval tables are great for people with kids! Rectangular coffee tables are decidedly more modern and they offer the most amount of surface space to work with. A round coffee table can be really inviting to guests and large families who may want to occasionally eat around the coffee table while watching a movie. Add some floor poufs to the other side, and it’s a party! Square coffee tables provide a nice and symmetrical look to your living space. They are the most practical coffee table shape and can sometimes offer storage beneath the surface. Our favorite coffee tables are often made of marble, brass, wood, or glass. Here are a few recommendations for each material. Marble coffee tables are one of the most highly sought-after coffee tables around. You can’t scroll through Pinterest or Instagram without seeing one! Marble is a heavy and expensive coffee table material. That being said, you can get a pretty great knock-off for as little as $98 (Over 900 people rated it 5 stars). Aged brass coffee tables can give a vintage appeal to your living room. Wood coffee tables are a great choice for farmhouse homes, and anyone who wants a rustic, country feel to their living room. Glass coffee tables are a minimal approach to the coffee table and allow the sofa to draw more attention. Mirrored coffee tables add a touch of elegance to any living room. You don’t have to stick to the traditional coffee table if you don’t want to. Many families choose to use a coffee table made from unconventional materials or objects. Think: a vintage trunk as a coffee table or a flea-market find! Some people choose to forego a coffee table altogether. Others opt for a slightly modified fabric version of the coffee table: the ottoman! Ottomans are great for doubling as a coffee table ADD a footrest. You can easily add a small tray to create a flat surface for when you need it. Many conveniently feature storage underneath, too! A new interior design trend that I see more and more is the nesting coffee table. Nesting coffee tables are 2-3 separate tables of varying heights and sizes that neatly come together to form a coffee table cluster. A nesting coffee table is great for adding extra dimensions to your living room. Freeform coffee tables are uniquely shaped tables that don’t really fit into one shape. They may be loosely square or loosely rectangular, to give you an idea of where they can fit. Freeform coffee tables are often made of live edge teak, but you can also find some mid-century modern freeform glass coffee tables like this one! 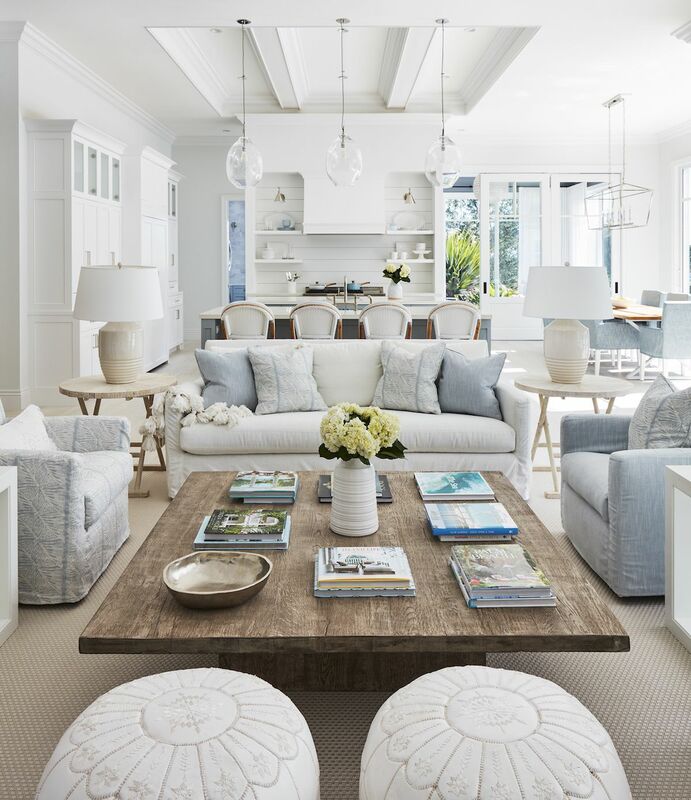 Similar to the nesting coffee table, I’ve seen beautiful living rooms that incorporate 2-3 side tables placed next to each other (often of varying heights) to form a casual coffee table. I hope this post inspired you and made your coffee table decision a bit easier! Let us know what you chose in the comments, or tag us on Instagram!